Hello from my reeeeeally cold sewing room!! I am sure everyone is ready for warmer temperatures! I know I am. . . if it weren't for the hot steam from my iron, I probably wouldn't be hanging out in my sewing room much. Armed with my not so cute anymore bath robe and thick socks, I've managed to get some work done. I'm really feeling the pressure of wanting to have a certain number of items read for the craft show in March, so no more messing about! I got to try out a few cool tutorials and patterns over the holidays to give as gifts. 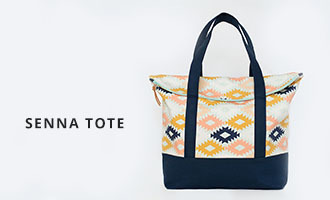 I think my favorite is Pink Penguin's Reversible Patchwork Bag. If you haven't tried this out, add it to your list! So fun and so cute. Next on my list is her Fabric Basket tute. 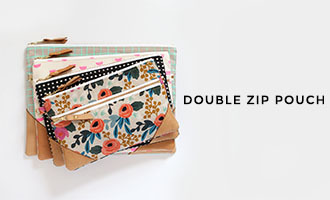 I really want something to hold mail/bills on my kitchen table and think this would be perfect. 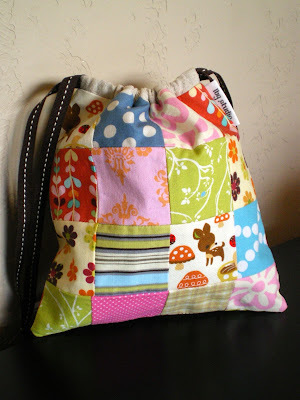 Also a perfect project for my new found patchwork addiction. I also tried out sewing paper for the first time. 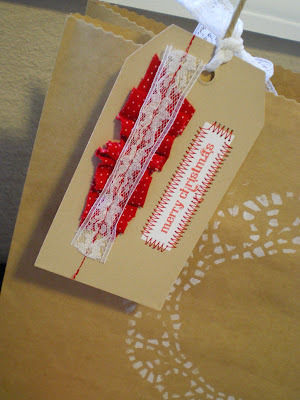 Inspired by these Christmas cards on the fabulous oh, hello friend blog, I made a gift tag to dress up a simple paper bag. Ok, blogging break is over, back to sewing I go. . . have a great weekend, everyone!